Dr. James Salazar and Dr. Marnie Schreiner are a husband and wife team that believe in treating our patients like family. 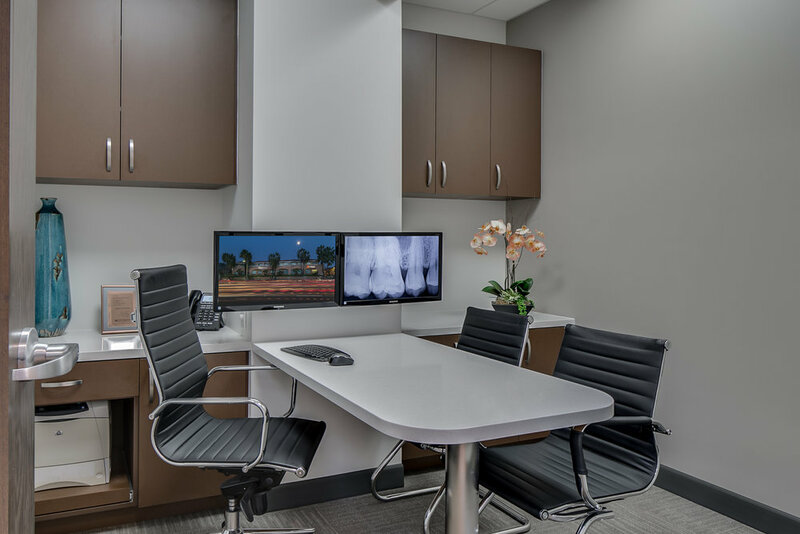 With each new patient, we take the time to conduct a comprehensive exam designed to set a course for life-long dental health, and a beautiful smile. A trip to the dentist often gets left off the priority list. We understand that many patients may have anxiety regarding their scheduled visit. Our goal is to provide a quality experience and the best care possible. We will always offer you the opportunity to become as healthy as you want to be. We’ll take the time to review every option available for you to achieve optimal oral health. Our diagnostic imaging includes high quality, low radiation digital x-rays and high resolution digital photography. We use state-of-the-art equipment and the highest quality materials and techniques to achieve beautiful, long-lasting results. When you arrive you will be welcomed by our friendly team members in our luxurious and comfortable space. We invite you to enjoy a beverage as soothing music and beautiful imagery helps you relax in our comfortable lobby. After meeting with your doctor in our private consultation room, you'll be escorted to a treatment room where you can lounge in a comfy chair with headphones, TV, and a blanket if you would like. Dr. James Salazar was born and raised in San Diego and graduated from San Diego State University and the University of California, San Francisco School of Dentistry. He has been practicing general and cosmetic dentistry in San Diego since 1999. He takes great pride in his comprehensive, honest and perfectionistic approach to dentistry, caring for patients of all ages. Dr. James Salazar earned accreditation from the American Academy of Cosmetic Dentistry (AAACD) in 2011, for his excellence in cosmetic dentistry on patient cases. Dr. Marnie Schreiner graduated from UC San Diego in 1998, and from the UCLA School of Dentistry in 2002 with Dean’s Honors and received the American Academy of Oral Medicine Award. After graduation from UCLA, Dr. Marnie Schreiner completed a general practice residency at the UCLA – VA Sepulveda dental facility. She annually exceeds the state continuing education requirements in a variety of disciplines, including cosmetic dentistry, general dentistry, Invisalign, endodontics, and periodontal care. San Diego's best dentists, Dr. James Salazar and Dr. Marnie Schreiner, offer cosmetic dentistry options that perfect your smile and restore your confidence. Dental health moves through many stages. Purely Dental Encinitas offers a range of preventive, cosmetic, & functional care for every age. Invisalign can improve your smile and your oral health by straightening your teeth with thin, invisible trays. Our experience with Invisalign puts a stunning smile within easy reach. Dr Salazar is an exceptionally thorough yet emphatic dentist. Recommend him highly. Dr. Salazar's attention to detail is second to none. He was incredibly kind, sincere, professional and GENUINELY cares about my health! I have never had such a through initial exam in all my years. Dr. Salazar could not be more gracious and professional. The entire experience was a true delight. I think these folks are the best of the BEST. Purely Dental is great! Dr Salazar is incredibly through and one of the most friendly people you'd ever meet. It is really a pleasure to be a patient here. Very professional dental experience in a high end state of the art facility. Dr. Salazar is very knowledgeable and makes patient care and comfort #1. Request your 5-Star appointment today! We proudly associate with these organizations.